Puppy house breaking should start just as soon as you bring your German Shepherd puppy home - and it is the best way to teach your GSD puppy to go outside when it has to relieve itself. This is a very important first form of dog training. How long does it take - puppy house training, I mean? The easiest answer is: as long as puppy house breaking takes. I had one German Shepherd puppy that house trained herself pretty much in just over 3 days, and I have had others that took closer to 2 weeks. German Shepherd puppies are different and not all can be house trained in the same amount of time. Time of GSD puppy house training can easily vary from puppy to puppy. Additionally, keep in mind that even though this article deals primarily with German Shepherd puppies (due to the focus of this web site) that many of these house training techniques can also be used with most other puppy breeds. When you get your GSD puppy home the first day, start puppy house breaking him immediately. After he has been briefly introduced to his home and new surroundings, give him a drink of water and immediately take him outside to relieve himself. Take the GSD puppy to the area you chose before bringing him home. Remember, choice of this house breaking spot is crucial as it enhances the house training - so take careful consideration of where "the house breaking spot" is before bringing your German Shepherd puppy home. There is a direct correlation between the time you actually put into the puppy housebreaking process and the speed in which the housebreaking of the German Shepherd Dog puppy successfully occurs. This is a very crucial puppy house breaking step so be patient and wait until the German Shepherd puppy relieves himself. It may take a while especially with all the new things happening to your GSD puppy, all the new smells, unfamiliar objects, etc. Do not play with the GSD puppy however until after it has "done it's business". If you do it may make the puppy forget about going at all. Since house breaking is all new to the German Shepherd puppy it doesn't know what it's purpose of being in "the house breaking spot" is in the first place. As soon as your GSD puppy finishes, praise it excitedly and immediately take him inside. From that point on, take the German Shepherd puppy to the same house breaking spot each time and encourage him with a command such as "go potty", "hurry up" or whatever you choose. so that the German Shepherd puppy will learn to associate this act with the command. This will be a huge help in the future, especially when in a new environment or location when traveling, visiting relatives/friends, etc. Being completely house broken and completely reliable is the final outcome you are looking for. You must watch them like a hawk at all times - in the beginning of house breaking especially. If you can not keep an eye on your German Shepherd puppy for some reason please put them in a safe and secure puppy proofed spot (such as a crate or some other small room with easy to clean floors, such as linoleum, closed off with a baby gate so you can peek in as needed). If you are consistent in your puppy house breaking in the very beginning, ESPECIALLY when it is inconvenient to you (late at night, while you are watching your favorite TV show, etc. ), you will actually help the German Shepherd puppy house break itself to alert you when it "has to go". and again before he goes to bed for the night. Another good house breaking tip is to take up the German Shepherd puppies water early in the evening and to not feed or water it after say, 6:00 at night. Otherwise you may have to make more house breaking potty trips than usual outside to let the puppy relieve itself. Keep the GSD puppy on a strict house breaking schedule, both feeding and elimination, and you will have German Shepherd puppy house breaking success much sooner. Know in advance that a very young GSD puppy will probably not be able to go through the night without relieving itself so get used to taking it out during the middle of the night until it grows enough to sleep through the night. You wouldn't expect a young human baby to be toilet trained in a week, would you? Give the same consideration to your new German Shepherd puppy. He will not be able to be considered reliable as far as house breaking goes either after only a few days. Remember, the GSD puppy is a baby too with a small bladder and weak sphincter muscles. Like human babies, your German Shepherd puppy will be able to go longer between house breaking breaks as it grows older and will soon become completely house broken if your are vigilant in the house breaking process. If you find your German Shepherd puppy has made a mistake in the house and you did not catch it in the act, simply clean the spot without comment. Clean up all residue and clean the area with a bacteria/enzyme digester. These house training aids are available at your pet supply or grocery store. This will get rid of both the stain and the smell. And the smell is the most important part to get rid of. 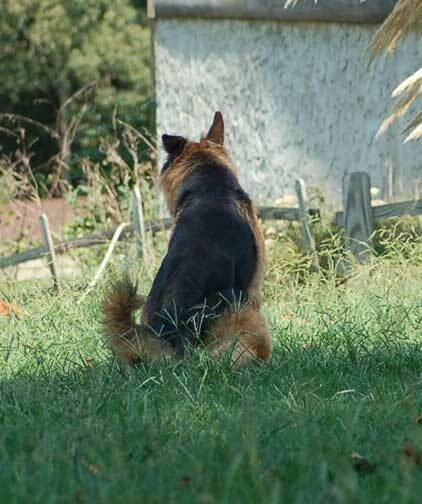 Even if you can't smell the urine, believe me, your GSD puppy can and he will be encouraged to go back to the same spot again unless you remove ALL urine odors. This is absolutely critical in house breaking your puppy. If you find the German Shepherd puppy "in the act", scoop him up as quickly as possible with his tail between his legs (to help prevent spillage) and take him out asap. Say "out" or "quick" as you take him out but never NO. Since No is used for negative things you do not want your puppy to think that eliminating is wrong, no matter where he does it. If the German Shepherd puppy thinks that eliminating is bad he will probably start hiding it from you and you do not want that to happen. That is a whole other behavioral issue to contend with and believe me it's much better and easier to prevent behavioral problems before they happen than having to deal with them later. Generally speaking, German Shepherd puppies are naturally clean dogs - assuming they had the right start clear from the beginning. GSD puppies raised in small runs or cages develop dirty habits right from the beginning making house breaking harder. Since they are used to playing and sleeping in their own excrement they will not have any problem with continuing to do so. This is not the German Shepherd puppy's fault, it's just what they were accustomed to from an early age. Keep in mind, house breaking puppies raised in these type of situations can be much harder and more time consuming than usual but house training can still can be accomplished. Overall, puppy house breaking problems are often more of a human problem than a German Shepherd puppy problem. If the new owner is steadfast in keeping a watch on the German Shepherd puppy in the beginning of ownership, especially during the first 2 weeks of house training, then puppy house breaking can be accomplished and the GSD puppy will become a reliable member of the family (as far as bathroom visits are concerned) and will soon be completely house broken. Remember, as the new owner you must be patient with the entire house breaking process. Each German Shepherd puppy will house train at his own speed and with your help. Take him out religiously as outlined above, and keep him on a strict feeding/bathroom house breaking schedule (as well as anytime the GSD puppy acts as though he has to "go out"). It is very important that you learn to read your German Shepherd puppies potty signals during the house breaking process: sniffing out "a spot", circling, whining, going to the door, etc. Finally, think about how you would like to be house trained if you were in the GSD puppies place. The German Shepherd puppy won't enjoy being yelled at, jerked around or frightened any better than you would. A kinder, gentler and more patient puppy house breaking approach will yield much better results, help your bond with your GSD puppy and develop a more confident house broken German Shepherd Dog in the long run. And isn't that what we all want as German Shepherd Dog owners in the first place? Recommended Reading: Written by a seasoned dog trainer, you can relax in the knowledge that all the great tips and advice included in this book are tried and true, and come from a real-life dog trainers everyday experiences. Want to learn more? Just click on the banner below.